Syrah’s spice and structure are great complements for beef prepared with Asian flavors. Try this recipe with any Tablas Creek Syrah or with the new Patelin de Tablas! 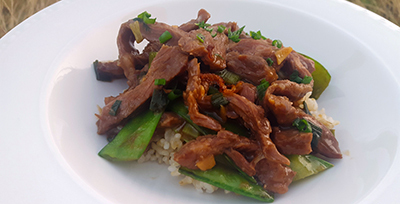 Combine soy sauce, sherry, brown sugar, corn starch, scallions, and ginger in large bowl. Slice beef thinly, and remove fat. Add meat to marinade, and toss until coated. Heat vegetable oil in a wok over high heat. Add snow peas and stir for 45 seconds. Remove the snow peas from wok and set aside. Let wok get very hot again, and, using tongs, add half of the meat mixture to the wok. Spread the meat out as you add it to the wok, but do not stir. Cook for one minute, until the meat browns. Turn meat over, and cook for another 30 seconds. Transfer to a clean plate. Let the wok get very hot again, and repeat with the other half of the meat. After turning it, add the first plateful of meat, the remaining marinade, and the snow peas. Stir over high heat for 30 seconds, then turn off heat. Add salt to taste.